Future telescopes such as NASA's James Webb Space Telescope (right) will observe atmospheres of exoplanets for signs of life. Oxygen/ozone reveal life on the modern Earth (top left). For the early Earth (bottom left), the combination of methane and carbon dioxide would provide an alternative biosignature, a new study suggests. Alien-life hunters should keep an open mind when scanning the atmospheres of exoplanets, a new study stresses. 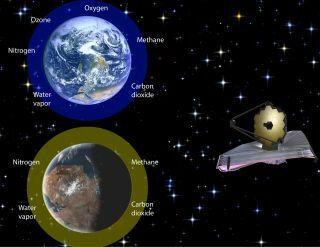 The time-honored strategy of looking for oxygen is indeed a good one, study team members said; after all, it's tough for this gas to build up in a planet's atmosphere if life isn't there churning it out. "Even if life is common in the cosmos, we have no idea if it will be life that makes oxygen," Krissansen-Totton added. "The biochemistry of oxygen production is very complex and could be quite rare." So, he and his colleagues took a broader view, studying Earth's history to identify combinations of gases that, if observed together by future instruments such as NASA's James Webb Space Telescope, would be strong evidence of life. They came up with what they think is a good candidate: Methane (CH4) and carbon dioxide (CO2), without any appreciable carbon monoxide (CO). As their chemical formulas show, methane and carbon dioxide are very different molecules. Their co-occurrence is indicative of an "atmospheric disequilibrium" — a term that gets astrobiologists pretty excited. "So you've got these extreme levels of oxidation. And it's hard to do that through non-biological processes without also producing carbon monoxide, which is intermediate," Krissansen-Totton said. "For example, planets with volcanoes that belch out carbon dioxide and methane will also tend to belch out carbon monoxide." In addition, many microbes here on Earth gobble up CO greedily. So, an abundance of this stuff in a planet's air would argue against the presence of life for several different reasons, study team members said. Proposing to look for compounds in disequilibrium isn't a novel idea. For example, other astrobiologists have suggested that the combination of methane and oxygen in an exoplanet's air would be a strong sign of life. "What's exciting is that our suggestion is doable, and may lead to the historic discovery of an extraterrestrial biosphere in the not-too-distant future," study co-author David Catling, a professor of Earth and space sciences at the University of Washington, said in the same statement. The new study was published online today (Jan. 24) in the journal Science Advances.